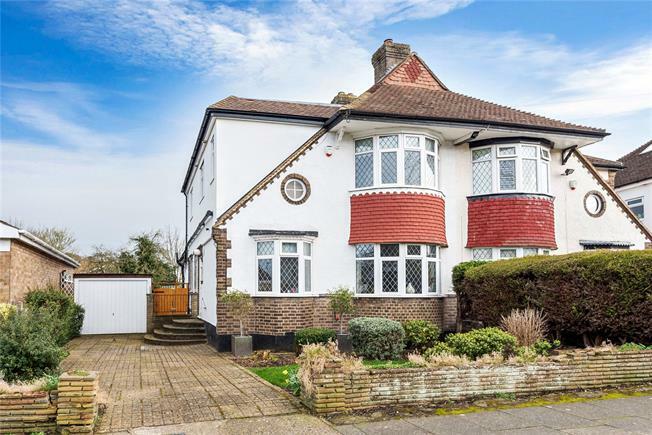 4 Bedroom House For Sale in West Wickham for Asking Price £670,000. Extended four bedroom semi-detached family home. The property is spacious, well presented and offers versatile accommodation. The ground floor briefly comprises; entrance hall, cloakroom, utility room, reception room to front with feature fireplace, study/bedroom four, second reception room extended open plan to a modern fitted kitchen with breakfast bar and doors out to garden. The first floor has a stylish contemporary bathroom with a separate walk-in shower and three double bedrooms, the master bedroom benefiting from an attractive en suite shower room. Externally the rear garden is mainly laid to lawn with a patio and a detached garage. To the front of this generous sized property is a driveway leading to the garage and further off-street parking. South Walk is situated close by local shops in Coney Hall Village, schools of good repute including Hawes Down Primary and both West Wickham and Hayes stations and High Streets. Viewing recommended.